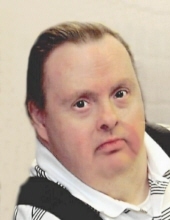 Billy Joe Gibson, 55, of Pana, passed away Saturday, December 1, 2018 in Memorial Medical Center, Springfield. He was born July 12, 1963 in Pana, son of the late Rev. Lawrence E. & Maxine (Allen) Gibson. Billy lived his whole life in Pana and was a member of the First United Pentecostal Church, Pana. Billy loved going places with his mom & dad, having attended the baseball spring training camp in Florida for several years. Billy loved going to the beach and going to church, especially the songs. He was truly loved by everyone. He is survived by his brothers, Larry Gibson of Pana and friend Dinette George of Springfield; Don (Marcia) Allen of Auburn; Dixie (Jerry) Fox of Grand Chain, IL; Shirley Ruot of Apache Junction, AZ; and Pat (Sonny) Lash of Wyaconda, MO. He was preceded in death by his parents; sister, Beverly Hayes; and brother, Brian Gibson. Funeral services for Billy will be held on Saturday, December 8, 2018 at 11:00 a.m. in McCracken-Dean Funeral Home with Rev. Robert Russell & Rev. Jonathan Blake officiating. Burial will be in Linwood Cemetery, Pana. Visitation will be Friday from 6 to 8 p.m. in the funeral home. Memorials in Billy’s honor may be made to the Epilepsy Foundation, 17 North State St., Suite 650, Chicago, IL 60602-3315. "Email Address" would like to share the life celebration of Billy Joe Gibson. Click on the "link" to go to share a favorite memory or leave a condolence message for the family.